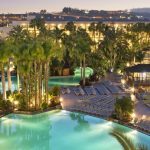 One of the most popular and oldest holiday resort located on the southern coast of Gran Canaria Maspalomas is a more peaceful resort and home to the glorious sand dunes and natural reserves of the lagoon and palm grove. Sheer paradise with a tropical climate all year round. 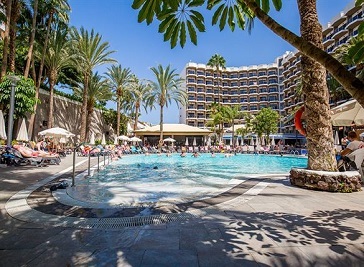 The Occidental Margaritas**** hotel (belonging to the Barceló Hotel Group and formerly the Barceló Margaritas) is located on Playa del Inglés, one of the most popular tourist resorts in the south of the island of Gran Canaria. Located 30 km from the airport and 60 km from the capital, Las Palmas de Gran Canaria. Your holiday hotel, placed in the centre of Playa del Inglés, right in front of the shopping centres "Kasbah", "Plaza" and "Metro". The hotel is situated only 200 meters from the promenade and 400 meters from the beach.